This weekend was spent doing more than I've done in a long time. I got my epidural shots and I'm sure that had something to do with the burst of energy! That, and Rick's boys and girlfriend were over this weekend which always makes for an energetic, fun-filled house. * Dusted like a fiend. Took a Benadryl to combat dust bunnies. Thought about vacuuming the cats. 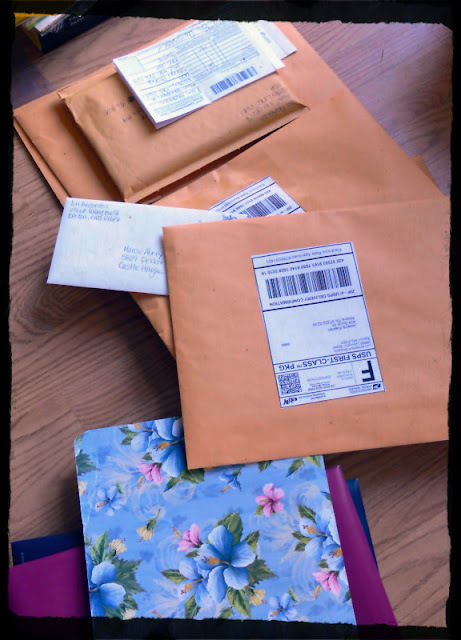 *Put together a ton of mail to send out. 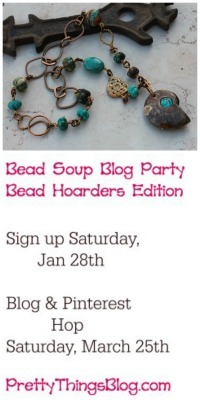 * Organized all my writing materials and beading materials for the next couple of weeks' happy obligations. I ended up organizing my vintage collections. They've spread all over the house, and I have a new cabinet from IKEA with a glass front so I can store some of the more delicate items that's needed attention -- but hey, who am I kidding. I just like to rearrange the collections! 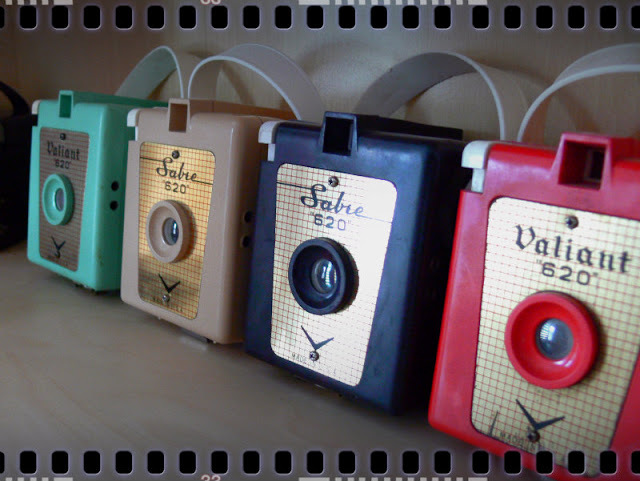 These are Sabre 620 and the rarer Valiant 620 cameras. They rock. The fun trivia about these are they were made without much regard to color matching -- meaning, you'll find a turquoise one with a black handle -- or a white handle. This is a favorite site showing them (click here). I have one with the flash attachment, and I plan to find the film and really work with these. I organized some vintage treasures that have been languishing in obscurity. That bottom key is a bit grim, but too interesting to pass up. It's the key to manacles from the Alto Adige Prison in Trentino, Italy, circa 1900. The upper key is a house key from Germany. 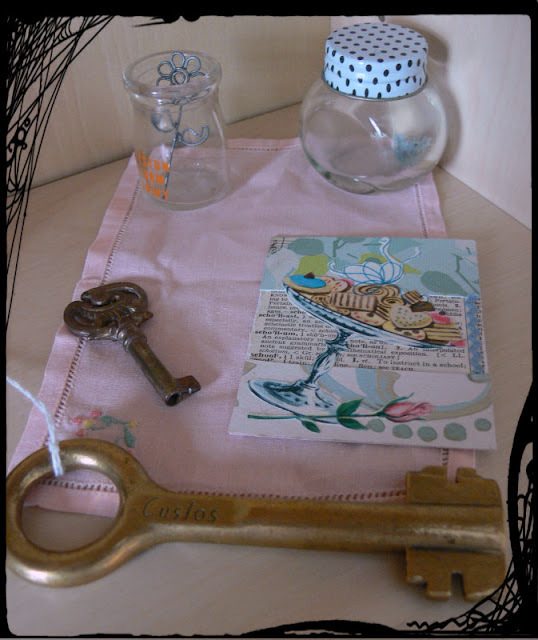 The left glass is a tiny cream bottle (from the time when milk was delivered) and the rest are things I've amassed over time. This is a new collection. I've had the wooden baby shoe forms for a while, but then, while exploring a local used book store, I found the most amazing find, one the proprietor said is indeed a rarity (and after I showed it to him I think he wished he'd charged a lot more!). 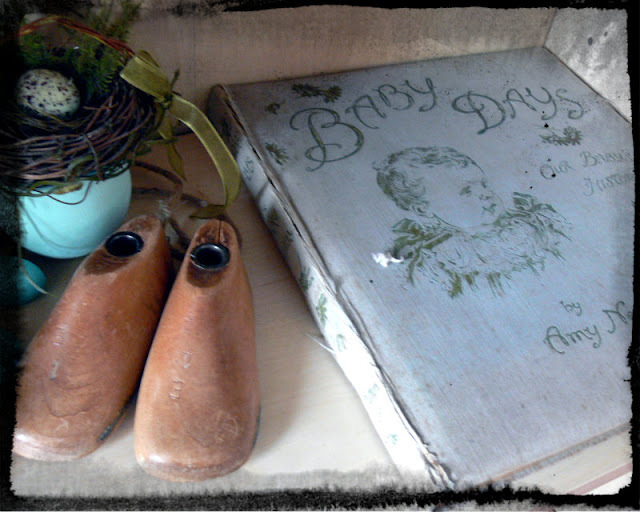 The baby book is full of beautiful notations all through the baby's life, including photographs. I adore it. Unseen, but on the other side of the shoes, is a collection of glass baby bottles imprinted with nursery rhymes, and I thought the eggs were perfect for a baby shelf. And then I reopened the lampwork studio after a full year. I'm having to start right from the beginning, but I spent a few hours trying to get my groove back, and there are some things in the kiln that I HOPE I can use for the April 4th Cup of Bead Soup mini-hop. I'm back to treating my business as, well, as a business. I'm keeping a calendar, making appointments for myself WITH myself, and with any luck at all will accomplish half of what I want to do. The good thing is, I enjoy it. Sometimes, I won't lie -- I want pie. BIG time pie. Pie cures all ailments, (even migraines, apparently!). It's hard work, often thankless work, and, I'm learning, competitive work (and I hate that part) but it's a great career. Wow, what a weekend, but it sounds that it was well worth it. Good luck with your business. Wow, what a busy weekend, but sounds like it was worth it. Good luck with the business. I hope I inherit my father's baby book. There's all this wonderful detail about him. And then in the depression era (and women second era) they couldn't afford another book for his younger sister, so her details are all footnotes to his. Something she jokingly never forgave him for! I'm so happy you had a good weekend. Sounds like you are finally getting some relief and have had a good and productive weekend. Have a great week - You deserve it !! So glad that you're feeling a little better!! Awesome that you're getting back into the lampwork studio...can't wait to see some of your creations!! I am so, so happy that you had a great weekend. Next time you have a bad one, just try to remember this one. Great old stuff. I like vintage things too. Just about everything I have is old, including my husband. What era are the cameras from? I had a camera as a kid that looked a lot like that, no idea whatever happened to it. You sound like you're feeling good! So glad it was a good weekend for you! It feels good to get organized, somehow organizes your mind too. Can't wait to see your lampwork creations! 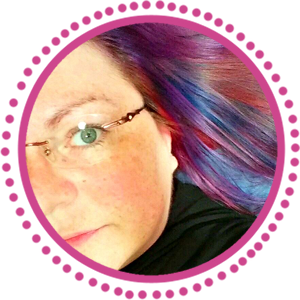 Today I was reading your interview in Tammy P's blog. 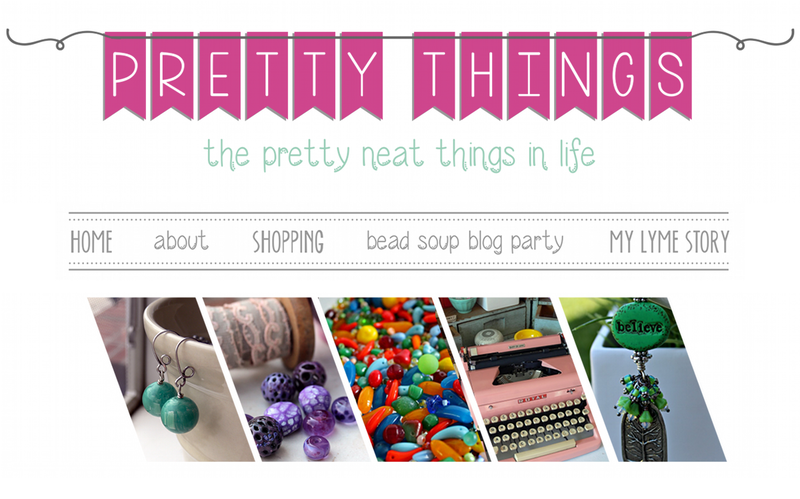 You are doing a great job sticking to your basic goal- nurturing fellow artists and bloggers. I look forward coming to your blog and find it such a friendly place. Take care, Lori, hope you feel better. Dita. Those cameras are stinkin' cute!!! I LOVE them! Congratulations on a productive weekend! I like this idea of making appointments with yourself. Wonderful inspiration for us all! Love the vintage! I think it's a good thing to have the KEY to the manacle rather than being stuck with the manacle itself! Good luck with the lampwork - I hope you'll show us what you make. I love lampwork, but I'm too much of a ninny to try it myself. Your photo's are always so breath-taking. You had a very productive weekend and I'm happy you're back in the lampwork studio. Have some pie and go torch some glass. Sounds like you are getting on with life at a rate of knots! I am glad to hear you are up and about and able to do stuff that makes you feel happy and satisfied. I think of you often and hope you have the pain at bay at least for some of each day. 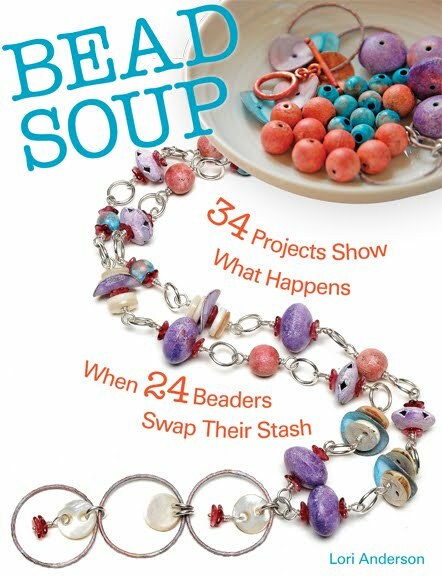 I am excited to see what lampwork beauties you come up with - I love the beads you sent me in the bead soup swap! Especially those encased pink ones, they are special. WHat wonderful treasures you have collected! I love that big key, I don't quite have a sense of it's size from your picture but it is unique, and although a little spooky to think of it's origins, pretty interesting. Your cameras are awesome too! I hope you do find film to work with them, I bet they would take some pretty pictures. Stay well! Here's to more epidurals! So glad to hear you were able to have a busy, pain-free weekend. 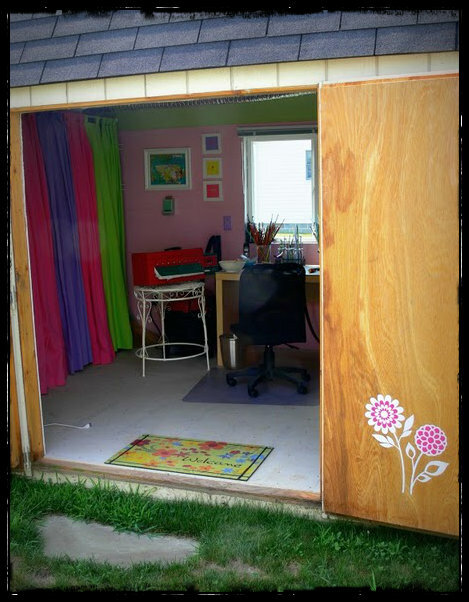 Love that you re-opened the Lampwork studio - looking forward to seeing your creations. That's great news. Glad to hear that you are movin' and groovin'. I'm excited to see that you have started lampworking again and look forward to seeing your creations. I think you will find that you will remember more than you might have thought. I was away from it for 5 years and, while I am still finding a few things more challenging, I have also found that if I just relaxed my subconscious and muscle memory would just take over. The more I worked the more that came back to me. Just have fun with it with no expectations for a little while. That was hard for me to do, but it definitely helped me get over a couple of bumps. I've got some cleaning and organizing on the to-do list this week, and I don't want to do it. Good for you for getting everything in order! Yaaaay! So glad to see you feeling a bit better! And so productive! Way to go, Lori! <3 <3 Hopefully this lasts and lasts! So wonderful fabulous awesome stupendous! Glad there is so much energy and lightness for you! THis month will be great. Love your vintage collection, Lori! Looks like your are feeling much better...energized and organized! Much success on your business! Glad you had such a good weekend! I've been doing some of the same 'Spring Claening'. But my collections are no wher near so interesting.